WASHINGTON — Newly empowered House Democrats on Wednesday elected Representative Hakeem Jeffries of New York to lead their caucus when they assume control in January, choosing a leading voice for generational change in the party as their fourth-ranking leader and a new face of their nascent majority. Mr. Jeffries, 48, who is African-American, has been among the most outspoken lawmakers to argue that the Democratic Party must shift to reflect the changing face of the country. His elevation to caucus chairman reflects a new urgency among House Democrats, in the wake of midterm election victories that ushered in a disproportionately young class of freshmen eager to shake up the stilted ways of Washington and inject the leadership with a different set of voices. But he beat an icon of the left, Representative Barbara Lee of California, who would have been the first black woman to be elected to that post. Ms. Lee, at 72, would also have been the fourth septuagenarian in the House Democratic leadership. 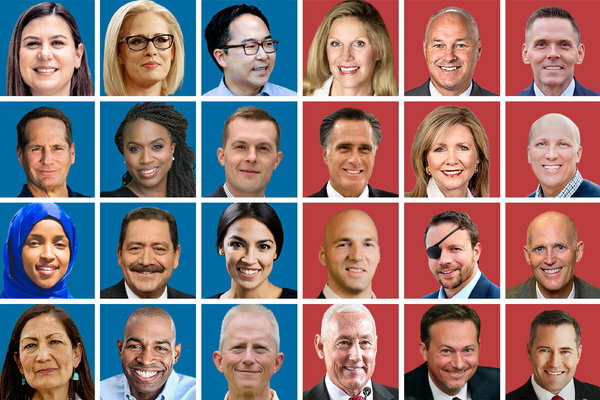 The congressional freshman class of 2019 includes the most racially diverse and most female group of representatives ever elected to the House. It came as Democrats began a marathon day of speeches and secret balloting behind closed doors in the shadow of the Capitol dome that is their first official chance to put a stamp on a new era of Democratic leadership. They are facing profound questions about how to position themselves in an era of divided government as a counterweight to President Trump and a Republican Senate — and as a political force capable of winning the White House in 2020. Representative Nancy Pelosi of California, the minority leader and the first woman to serve as House speaker, is expected to easily win a vote to designate her for the top post once again, but the tally will test the strength and the staying power of a mini-rebellion among lawmakers and members-elect pushing for change at the top of the party. The true vote for speaker comes in January, but her opponents hope to demonstrate that Ms. Pelosi, 78, will not have the 218 votes to be elected to the job. A poor showing on Wednesday, even if she secures a majority of Democratic votes, could force a debate over an alternative or a compromise in other leadership posts that would ensure a generational change at the top. Among those set to vouch for Ms. Pelosi were Representative Joe Kennedy III of Massachusetts, the 38-year-old grandson of Robert F. Kennedy, who was to formally nominate her, and a dozen others spanning the ideological and age spectrum, including Representative John Lewis of Georgia, the 78-year-old civil rights icon, and Representative-elect Katie Hill of California, 31. Like Ms. Pelosi, the other top two Democratic leaders, Representative Steny H. Hoyer of Maryland, 79, and Representative James E. Clyburn of South Carolina, 78, have no opposition in their bids to keep their positions. Still, many Democrats have expressed concern, both publicly and privately, about re-electing a trio of septuagenarians who have led the party for more than 10 years at a time when the party should be redefining itself for the future. Mr. Jeffries’ elevation could allay some of those worries. Lawmakers and members-elect filed Wednesday morning into a large auditorium in the Capitol Visitors Center for a full day of intraparty discussions, with the elections expected to stretch into the evening and potentially to extend to Thursday. Each member was given a manila envelope as they headed into the secure room for the private proceedings, and aides rushed around the marble floors. One entered holding what appeared to be a chime as the secret paper balloting began. What to stream this weekend: "Homecoming," "House of Cards," and "Shut Up and Dribble"